How to do a Head Swap in Photoshop (It's SO easy, I promise)!! How to do a Head Swap in Photoshop (It’s SO easy, I promise)!! 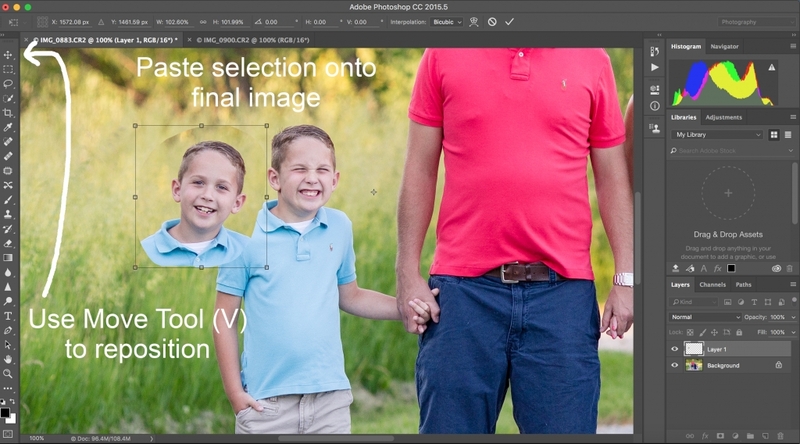 Ever wonder how the heck to do a head swap in Photoshop! Don’t worry, it’s easier than you think! 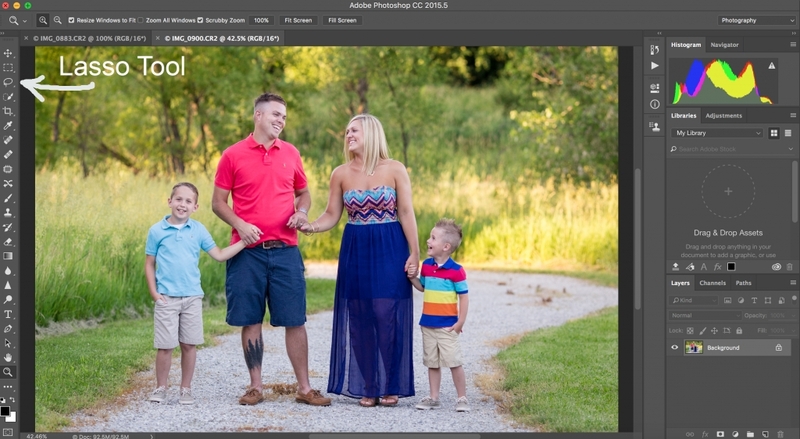 I’m mostly a Lightroom girl, but every now and then there are things I need to do that make Photoshop a must-have. One of those things is doing a head swap. Every now and then, I run into a situation where I have an image I love, but one person’s expression is off. We’ve all been there! Thankfully, once you know how to do a head swap in Photoshop, you’ve got an easy solution! Using the Lasso tool (L), select the area to be duplicated by creating a large circle around it. Be sure to leave plenty of space for blending later. Go to the image you plan to use for your final image, and paste the selection onto photo (command V or control V). Use Move tool (V) to place new face where it needs to go. You can use Zoom tool (Z) to zoom in and reduce the opacity if needed to get good placement. Try to line it up as good as possible. Once you have it lined up, bring your opacity backup, and add a Layer Mask. The layer mask will allow you to manipulate what parts of the new layer are visible, and what parts are not. Use a soft black brush (B) to brush off the edges of the new layer, blending it into the new image. Start by removing the hard edges first, then work your way into blending the rest. If you’d like to follow along with me as I do a head swap in Photoshop, you can watch this step by step process in the video below. 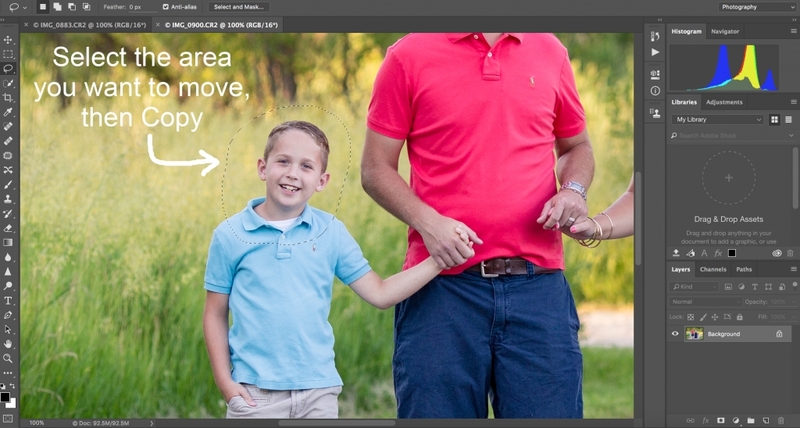 Now that you know how to do a head swap in Photoshop, you don’t have to panic if there’s that one person not looking at the camera, or when your favorite shot is ruined by the two-year-old looking away just as the shutter clicks. Give this a try and let us know how it goes! 10 Responses to How to do a Head Swap in Photoshop (It’s SO easy, I promise)!! Thank you for sharing with us. Your video really brought the whole process together. Well done! Excellent tutorial…. thank you so much for sharing and teaching! Excellent , thanks so much! Amazing tutorial! It worked great on my first try. Thank you so much!!! Great information. Thank you so much! !